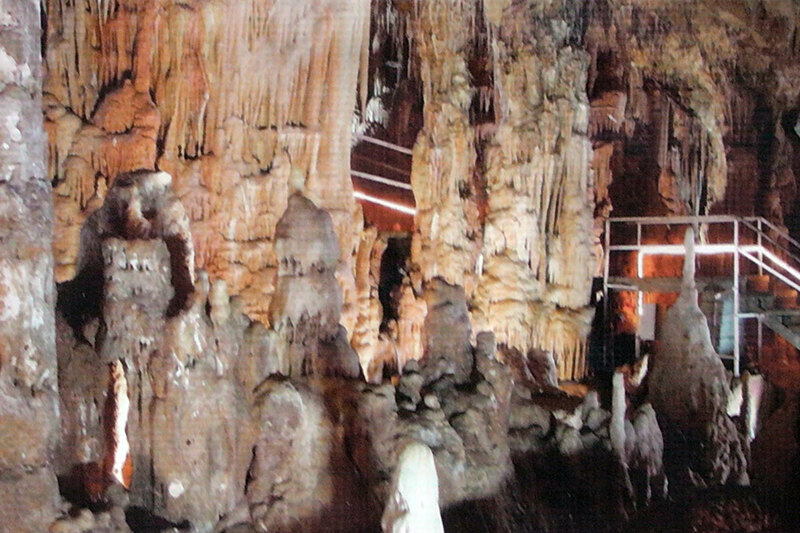 The cave of Petralona “embellished” with stalagmites and stalactites is located in the west foot of the Katsika (Goat) mountain and in an altitude of about 300 meters from the level of sea. The systematic excavations of the Cave began in 1965 by the founder of the Anthropologic Company of Greece, anthropologist professor Aris Paulianos. His researches proved that the Arhanthropos is about 700.000 years old, and this makes him the “oldest” European. This age was determined after the detailed analysis of stratigraphy (until today 28 geological layer have been revealed), and after studying the primitive and Paleolithic tools as well as the palaiofauna that were discovered in almost all the layers. Among the fossils of animals that have extinct the following are included: lions, hyenas, bears, panthers, elephants, rhinoceros, megakeroi, bison and various species of deer and hippo, and also 25 species of birds, 16 species of rodents and 17 species of bats.